January 23rd, 2019 – Writer W.S. Quinton and artist Alexia Veldhuisen brought their vision of the samurai epic to KickStarter in a bold way. This new comic book, 47 Furious Tails Issue One, is the first in a twelve-issue limited series that tells the classic story of the 47 Ronin in brilliantly-illustrated comic book pages. In issue one, readers are introduced to key actors in this historic legend as Asano Naganori prepares to leave Ako for his fateful, final trip to Edo. Based on historic and literary accounts, 47 Furious Tails portrays the characters from this classic tale as anthropomorphic animals, making each character beautifully unique. Issue one immerses the reader in the lives of these famous samurai as they carry on with their lives before the coming of events that would transform them into legends. Witness as Asano Naganori meets with his loyal Oishi Yoshio, and behold the prowess of the elder samurai Horibe Yahei and the young Oishi Chikara as they defend Ako from fierce bandits. 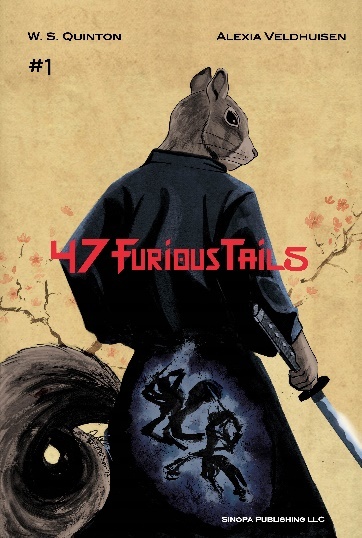 Fantastic art, devotion to duty and fierce samurai action await the reader, in 47 Furious Tails.